The gnomes must have realized how suicidal it would have been to turn on us, so they did not attack during the night. Instead, we all woke up to a very, very thick fog cover. After we stumbled around for a few minutes, we determined the fog was magical in nature. Wintersky and I did not have much problem dispelling it. At about that time, I also made a new friend: a softskin woman named Luanes came to us on a flying horse yesterday morning. She said she was sent by her father to aid us. I'm not sure exactly what we did to deserve her protection, but she seems capable enough. She has a mean looking sword, and she wears a lot of armor. Almost too much in fact. That poor flying horse is going to drop dead from exhaustion, I think. At least it will make for good eating when that happens. With our new friend in tow, we traveled most of yesterday to get to the Princess's lair. There is not much to say about it. No more fey bothered us, nor any dragons, nor bandits. When it got dark, we set up camp. But, lest our lives become uninteresting, we were attacked in the night by 4 of the Lady's pet gargoyles. The only real damage they caused was to interrupt our sleep. Even Sparta's dog finished one of them off, so they were not exceptionally tough or interesting. The next morning, we finally reached the home of the Lady dragon. Just getting inside it was a bit of a hassle because the entrance was high up into a cliff face. Still, we managed it with a combination of ropes, fly spells, and the use of Luanes's flying horse. The lair's main defense seems to have just been a confusing network of tunnels. There were some half-dragon minotaurs to contend with as well, but since they attacked one by one instead of en masse, it was easy to divide and conquer them. We pressed on. 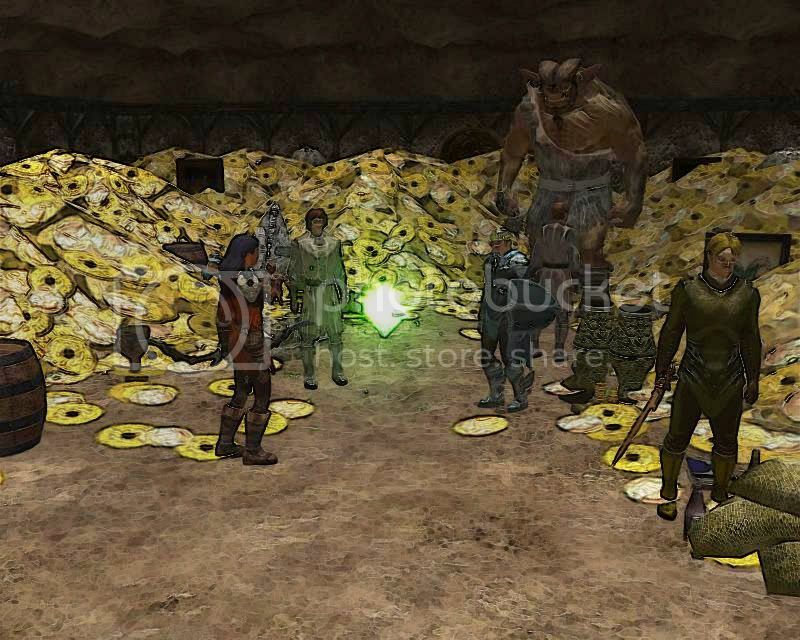 At the heart of the tunnel system was an enormous pile of treasure and a full minotaur. It seems the Lady kept him as a uh, pet of sorts. The half-dragons were his children. Rorkus, the minotaur, was quite happy to leave after we claimed the spoils. Something about a geas, but he did not elaborate. In a remarkable coincidence, Oliveryn had Orbs of Dragonkind on his mind as well. He was actively seeking one out, and he actually found one in the hoard. And that is scary. Does he not realize what that artifact is? It dominates dragons, but it also makes its wielder an enemy of dragonkind forever. As it should! What fool would think it a good idea to use magic to command some of the most powerful beings in the world? And that is not addressing the moral issues involved. How would Oliveryn feel, I wonder, if I used an artifact to control the obedience of all humans? Does he think free will is only important for softskins? Luckily for Oli, General Aifos made a timely intervention to claim the orb and take it into his care. I would rather see the orb destroyed entirely, but I was not about to confront the General about the matter. Besides, I was more occupied in cataloging our new wealth! For me, the most interesting item was a blue robe. It is a bit more tightly fitting than my old robe, as it has shorter sleeves, less folds around the waist, and a bottom that does not drag along the ground. As for its composition, its weave seems to be a very fine type of silk. It would be a very eye-catching robe even without its magical properties. As soon as I put on the robe, I almost lost my balance from its strange properties. I feel a strange sense of vertigo when I am wearing it, as if I am falling into the depths of my own clothing. It takes some getting used to, to be sure. Apparently, the "falling" effect works both ways: I can summon creatures from other worlds by using the robe as a focus. I suspect I'll be calling creatures from the Plane of Fire mostly. Ooh, that will give me a chance to practice my Ignan! Anyway, if the situation calls for something else, I will just have to adapt.